Ok, just to say this before I start, I am no expert on this subject! This time, I’m gonna talk about the different kinds of ropes that I know about. Catch ropes are made out of many different kinds of materials; from dead cows to plastic and made in any length the roper likes. 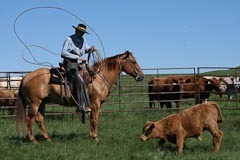 The first ropes were mostly reatas braided or twisted from strands of rawhide. There are also grass ropes called magueys. These are twisted from the fibers of the maguey plant in Mexico. Both of these styles of rope are considered traditional and both are still being used. These tended to be longer ropes, as they break easier and require more handle to keep them in one piece! Magueys are very temperamental in cold or wet weather and reatas need to be kept greased so they don’t get brittle. Although some guys still use both kinds, they’re generally kept for nicer days when you’re having good luck with your throwing arm; days which come few and far between for me, ha ha! The most common catch ropes around probably would be nylon. Almost everybody, from team ropers to buckaroos use a nylon on occasion, team ropers more so than most buckaroos. Team ropes tend to be made with a harder lay (tighter twist) meaning that they’re stiffer and stand up more for fast heel shots, which is the whole point of team roping. If a buckaroo uses a nylon, they’re generally longer like a reata, have a softer lay, with more weight for longer throws. Nylon ranch ropes are first made coated with wax, this gives them more weight and they feel really really good… for awhile. Then the wax wears off and they get light and fuzzy and feel kinda like throwing a thread out there but that’s when they make pretty nice ropes for catching horses because they’re soft and won’t generally burn the horse. The poly is usually the buckaroo’s favorite twine though, as there are just so many different styles and ways that they’re made so he can usually buy the perfect rope to suit his taste; this doesn’t usually help me out any though! Poly rope was originally built for ocean fishing line… and how it got into the hands of us ropers I can’t tell you but it sure fit the bill for a good rope that feels about as close to a broken-in reata (but with more tolerance for abuse) as we can get. Poly ropes are generally three strands but they can also be four which is what I prefer; although they don’t last as long (I wish they did though, as I sometimes catch with one!). Another rope that’s starting to grow in popularity comes from Mexico; the cotton. Cotton ropes are twisted out of an uneven number of strands, usually 5 or 7; and the feel of them (soft or stiffer) depends largely on the rope and what coil it was cut off of. The reason for their popularity is that with proper nurturing, care and feeding, they can be turned into a great feeling rope that will outlast any other chunk of twine that I know of. Most guys have their own recipe of ‘stuff’ to soak their new cotton rope in; ranging from plain beeswax to rawhide cream to a mixture of stuff that’s been grown in a pot in the back of the barn. Some guys I know just rope with them the way they are but most soak them in linseed oil, which gives them more life and helps them resist moisture. Moisture is bad news for a cotton rope (it feels similar to roping with a coil of barb wire). Another good thing about a cotton is that since they’re just like a cotton shirt, they’re dyeable! I have a very attractive green one and I’ve been toying with the idea of tie-dyeing one. I could go on and on about what kinds of ropes I like and and the different uses and shots each is best suited for but I think I’ll save that for another time! Comments for "Learning the Ropes"
Tell Deatrich on March 12, 2011 How do you soak them in the linseed oil without buying a whole bunch of the stuff. Ive heard your supposed to just rub it on, but I’m not sure I’m gonna get much on that way. Jake Wald on March 16, 2011 Well if you’re gonna rub it in the rope by hand, then stretch the rope between two posts. Apply more than one coat and you should be able to get a good soak on it. Or you could actually dip the rope in a bucket of linseed oil, hold it under for a second, and then let it dry. You might need to do this once or twice too. It all depends on how much oil you want in your rope and what works best for you and that particular rope.